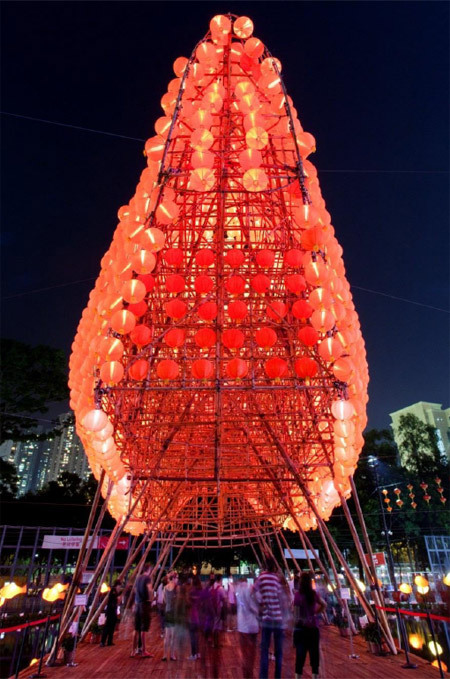 Hong Kong by CL3 Architects Ltd.
Lantern wonderland is a special project for the celebration of the Mid Autumn Festival. 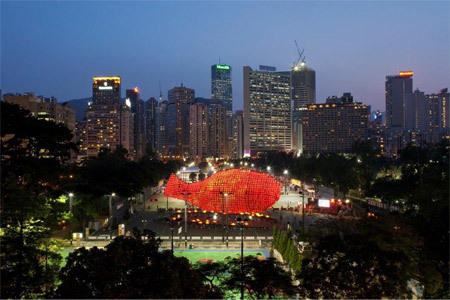 Measuring 37 m x 16.6 m high x 9 m, and consists of over 2,500 small lanterns, this structure received a Guinness Book World record and was visited by over 150,000 people. 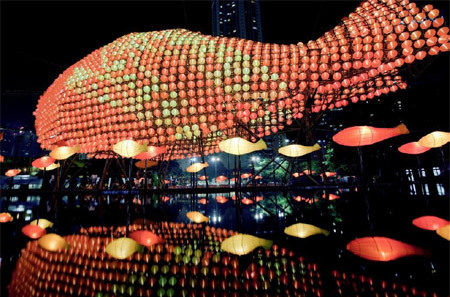 Traditionally, the fish in the Chinese culture is a symbol for prosperity and abundance, and therefore has always been used as an icon in celebrations and also in art and everyday objects. 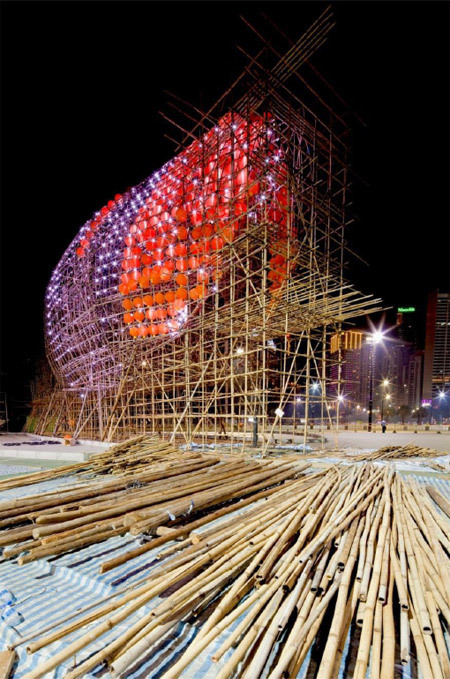 The base of the fish is constructed with timber logs to form 5 giant “A” frames, which then supports the fish body. 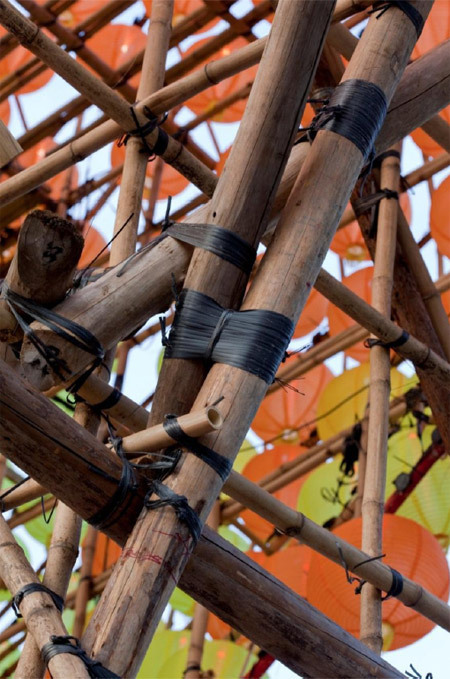 Raised 3.5 meters above ground, and consists of a cage completely weaved out of about 2,000 sticks of bamboo, the entire structure, based on traditional Hong Kong scaffolding techniques, is held together with hand tied knots, so not a single nail is employed. 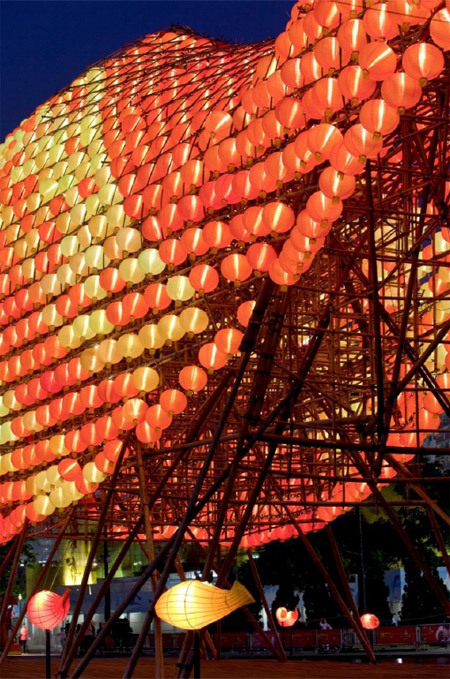 The entire display has to be constructed in 12 days and taken down in 3 days, which makes the bamboo technique the only sustainable and viable construction method. Nevertheless, full compliance with building and fire safety has to be met. All materials used are sustainable. The flooring has been recycled over 20 years as temporary flooring Chinese opera structures.